In all honesty, ever since I started using ThinkPads, I have found that the Fn Ctrl placement makes the most sense. Personally I never use the Ctrl key, apart from maybe word processing, so perhaps that is the reason. To me the single most deciding factor of keeping the Fn key on the extreme low left of the ThinkPad keyboard is the ThinkLight. I reckon that I probably use that key combination the most with my current X61. Others include launching the power scheme panel, quickly putting the ThinkPad into standby mode and dimming or brightening the screen. 1. Swap the 'CapsLock' key for the 'Ctrl' key. 'CapsLock' is a redundant key, one that I or the majority of people I know would never use in its default state. 2. Offer a BIOS solution for those who are keen on remapping the 'Fn' and 'Ctrl' keys. This is probably an ideal solution. All ThinkPads should still ship with the default 'Fn' 'Ctrl' positioning though. Getting rid of the 'Windows' key in order to fit in a larger 'Ctrl' key seem to be a popular request, but I think the request is born more out of hatred of Microsoft than anything. Perhaps replacing the key symbol with something more neutral would be more appropriate. 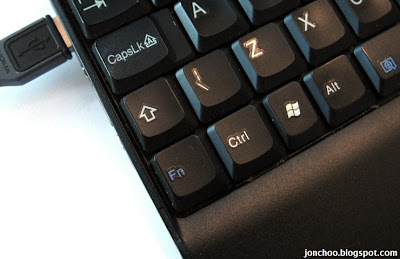 Personally, I still believe the best solution is to replace the 'CapsLock' key with the 'Ctrl' key. No. Caps Lock cannot be where CTRL is. That is lame and totally non-standard, unless you have a beard and live in a university dungeon. Also, FN CTRL is bad. It should be CTRL FN because CTRL is used 100:1 over FN for most people. Guess what, most people use word processing. The poor rationale of FN in the corner is better solved by having a dedicated "lights on" key. Easier, and doesn't require the prime real estate of CTRL to be usurped.